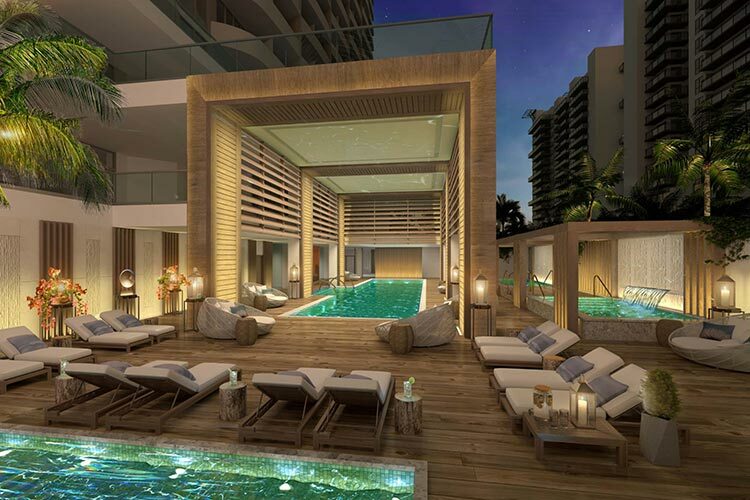 Developer Dilip Barot is building what he calls an “urban destination spa resort” on Singer Island in Palm Beach, Florida with a 100,000sq ft (9,290sq m) ESPA spa. Spread across seven acres on the Atlantic shoreline, the Amrit Ocean Resort & Residences will have a focus on wellness lifestyle, taking inspiration from Patanjali yoga and with a focus on mindful living, bringing Eastern traditions of inner science together with Western luxury. Two towers – named Peace and Happiness – will house 150 hotel guest rooms, 359 residences, and a four-story spa designed in collaboration with ESPA. Practitioners will focus on preventative maintenance and personalized wellness, and industry veteran Alison Howland – who was part of the original vision team – has been named vice president of wellness programs and resources for Amrit. Barot hopes to help guests and residents “achieve a personalized roadmap for wellness,” he says.